of court over accusations that he trashed his luxurious former home and failed to pay rent, according to lawyers who were suing him for £200,000. Landlords Jeff and Dawn Grant claimed Carroll damaged antique furniture and fittings, removed plates and TVs from the house, and left it in such a state that it needed more than £48,000 of repairs and cleaning. 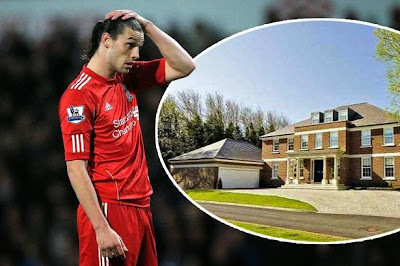 They claimed the player, who signed for Liverpool for £35m in 2011, the most expensive ever signing at the time, missed £68,000 of rental payments on the £2m mansion in Hall Road East, Blundellsands. The claims first came to light in 2013, when Carroll was loaned to West Ham United, before moving there permanently. Now, a solicitor acting on behalf of the landlords has said the case was settled out of court, but would not say for how much. The palatial home has five bedrooms and is set within a gated community. Items such as a barbecue, garden lounger and an air hockey table were also said to be damaged. Court papers issued in 2013 on London-based solicitors acting for the player alleged that Carroll took away £75,000 of furniture and expensive stereo and CCTV systems. Among the areas of the mansion worst affected were said to be the marble-tiled dining room, which leads on to the pool complex and Jacuzzi, and which contained a considerable amount of antique furniture. The court papers claim chairs needed to be re-upholstered and mirrors replaced, and smashed glass was left in the swimming pool area. Carroll denied owing the Grants any money, and is understood to have claimed he placed a number of items in storage in a bid to protect the £15,000 deposit he paid on moving in to the house. He and the Grants had agreed a two-year tenancy, during which Carroll was sent to West Ham on loan, before completing a permanent move to the London club after the tenancy expired in May 2013. A representative for Carroll was contacted but was not willing to comment on the matter.